ParentingAces - The Junior Tennis and College Tennis Podcast: Sports Made Easy - Great New Tennis App! Sports Made Easy, formerly known as My Game Solutions, is an online community that connects players, instructors, and facilities in real time. With the mobile app you can search for players using any preferred location and find a place to play. Participate in a friendly game or competition to help you improve your overall game. Parents and junior players can use the app to schedule practice matches which can be reported to UTR directly through the app IF both players agree. Sports Made Easy really does make the whole notion of playing more practice matches so easy! As a service provider - such as coach, hitting partner, personal trainer, and racquet stringer - you can promote your services on the platform and reach new clientele. As a service provider, get real-time messages and bookings through this innovative app. For more information, please email customer support. 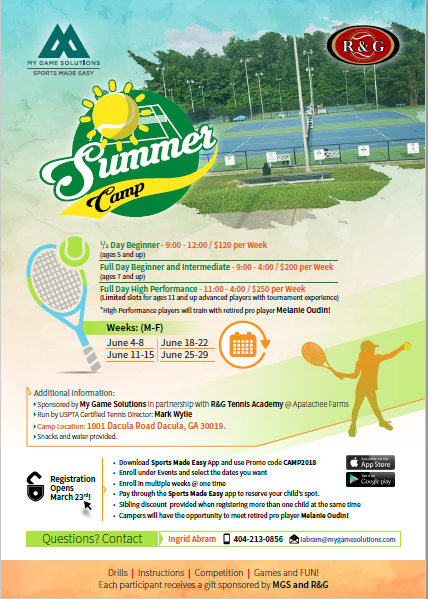 They are also conducting a summer camp with a subsidized rate plan for high performance and beginners. High performance kids will be trained with retired pro Melanie Oudin. Check out their events on their website or download the app and register to view all the upcoming events. Neil and Chuck have offered a generous discount to the ParentingAces community! While the Basic Version of the app is free for everyone, Parenting Aces community members will get 30 days of Premium Services for free and a 20% discount on monthly subscription charges for each month you pay for Premium Service until the end of 2018. You simply need to use promo code PA2018 while registering.